One of the challenges you have when you live in the swamps and wetlands of East Texas are Mosquitoes. We grow ’em big here and when when they bite, you know it. It is a shame too! 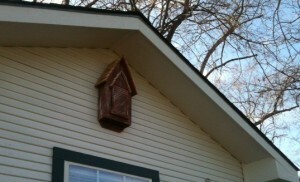 So many pretty nights our guests here at the Carriage House Bed and Breakfast have been ran back inside from the pests. We have tried everything to combat them. We have burned citronella candles. We ran the little Off fans and finally we just started putting cans of bug spray around the property for the guests to use. Nothing says a romantic evening, then the smell of DEET. 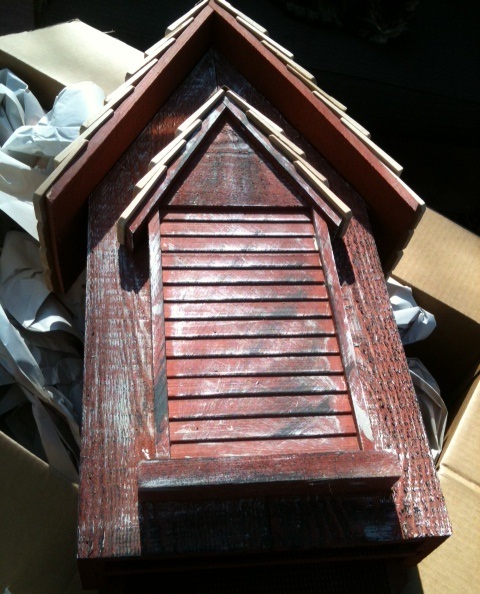 So last summer, I began a campaign to get a bat house. We have 32 native species of bats here in Texas, and as we all know, they LOVE to eat mosquitoes. In fact, the Little Brown Bat can eat between 500 and 1000 mosquitos an HOUR!! So for Christmas, Santa brought me a bat house and today Santa put it up for me. It is outside the Ruth Lester room in the Garden Courtyard. We positioned it in a place where the bats would be happy roosting and our guests can watch them at dusk. So, now all I need are some bats. This entry was posted on Saturday, February 4th, 2012 at 9:18 pm and is filed under Bed and Breakfast, Jefferson Texas, The Carriage House Bed and Breakfast. You can follow any responses to this entry through the RSS 2.0 feed. Both comments and pings are currently closed.